CM Magazine: A Very Small Something. David Hickey. Illustrated by Alexander Griggs-Burr. 32 pp., pbk. & hc., $9.95 (pbk. ), $15.95 (hc). ISBN 978-1-926845-32-6 (pbk. ), ISBN 978-1-926845-37-1 (hc.). Couldn't blow a single bubble. Tying a shoelace, riding a bike, learning to read � almost everyone can remember the intense longing one felt as a small child to be able to do some seemingly impossible thing that older children appeared to have mastered effortlessly. This feeling is communicated very clearly in A Very Small Something. Olive Bezzlebee wants to be able to blow a bubble. This seems like a 'very small something' to want, but, to Olive, it is the thing she wants most of all. Practice and dedication do not pay off and finally, afraid that she will be made fun of for her lack of blowing bubble skills, Olive sets out on her own. This tale favours a happy ending, and, in the end, Olive has her desire granted. This story explores the way in which certain 'small somethings' come to us when we least expect them. Biblioasis is a publisher of poetry, fiction and nonfiction, and A Very Small Something appears to be their first picturebook for children. Author David Hickey is also the author of two books of poetry with Biblioasis. 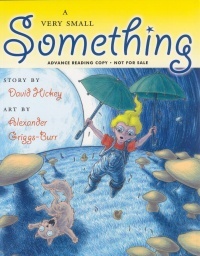 The rhyming prose of this picturebook is successful in communicating feelings that often seem impossible to articulate. Like a frog prince's crown. Alexander Griggs-Burr's illustrations are, in and of themselves, also very imaginative. They are drawn in what looks to be pencil crayon, light lines, plenty of light, the use of many colours and very expressive characters. Every element of the book seems to be well constructed, but somehow the sum of its parts falls short. 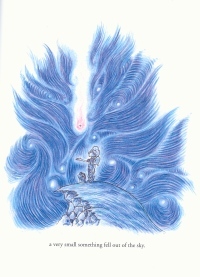 It is the medium perhaps (pencil crayons) that can be faulted with the unfinished feel and limited depth of the spreads. Stylistic concerns aside A Very Simple Something captures simple longing with levity and will appeal to many aspiring bubble blowers. Lara LeMoal is currently pursuing a Master of Arts in Children's Literature at the University of British Columbia in Vancouver, BC.